Forget everything you ever learned about plagiarism. Not only is it no longer being condemned; it’s being encouraged by Russell Branzell, president and CEO of CHIME, who believes sharing and stealing ideas “as quickly as we can” is essential to the survival of CIOs. In this interview, Branzell speaks candidly about a number of topics affecting CIOs, including the midpoint of Meaningful Use, which he believes is the perfect opportunity to look at the program in its entirety. 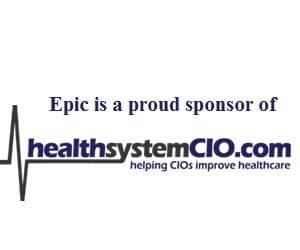 He also talks about the work CHIME is doing to make sure its offerings meet the evolving needs of its membership; what the CIO 3.0 might look like; his thoughts on the direction of the industry; and what CIOs will be buzzing about at HIMSS15. It’s not that we’re against the system. We’re absolutely for MU. We still think that’s the right direction. We still think the adoption of EHRs and the outcomes that should come from that is absolutely the right direction, but occasionally you need to make small course corrections to stay on track. It’s time to actually realize we have another half of this journey to go. And I think that’s exactly where we are in MU. Yes, we’ve seen positive outcomes. Yes, lives have been saved. Yes, many hospitals have changed their processes. We have a lot more work to do though. We don’t have that today, and it’s really a cornerstone problem in that if you don’t set the cornerstone right, everything else seems to be misaligned. It doesn’t matter at this point as to the individuals, but rather, conceptually, do they have an entire leadership team dedicated to driving us forward? Gamble: Hi Russ, thank you as always for taking the time to speak with us. I really appreciate it and it’s good for our readers to get your perspective. Branzell: Thank you very much for having us today. Gamble: Sure thing. I wanted to start by talking about the announcement from CMS in January about modifying the Meaningful Use requirements. Basically what that means for CIOs, but then also all the people who have put all the hard work into this. Branzell: Absolutely. I think this announcement that’s occurred and the perspective of a new reporting rule that will come out, NPRM, is a recognition of where we’re at in the process. We’re at midstream through the Meaningful Use journey. If you cut the stages, we’re right in the middle of stage 2, and it was time for a review or a reality check to the entire process. There were definitely some issues relative to reporting, and the requirement for 365 for this year really would’ve placed the burden on everything from the software vendors to the CIOs to the caregivers through the entire continuum, including not only the hospitals, but the physicians as well. And so that recognition that some flexibility in the reporting was needed to ensure the momentum stayed where it was, if not ramped up, for Meaningful Use stage 2, was very appropriate. We’re appreciative of ONC and CMS listening to the industry, in particular for our members who are trying to implement and modify these systems to be able to meet not only Meaningful Use, but the triple aim, so I think we’re very fortunate there. I think where we really are overall in this midpoint is an opportunity to look at the entire program in its totality. And this is really a CMS/ONC decision, but are we at a point where there’s other flexibility needed, and we would argue yes. There still needs to be an enforcement of clear and defined standards, and they’ve announced that. There’s still some need for interoperability, and they’ve now put up their interoperability roadmap. And so between that and still some things that we’re concerned about, like an all-or-nothing reporting process and things of that nature, I think we’re at a point now where both CMS and ONC are taking a real hard look at the program to see if we can move forward successfully, if not ramp up the adoption and hopefully outcome improvement that we’ve all been hoping for. Gamble: Right. Now we had all seen the numbers in December that about 35 percent of hospitals and then 4 percent of eligible providers had met Stage 2, and I know that that was something that was really a red flag as far as the struggles that hospitals and providers were having. I would imagine that to see a response to this was very validating and confirmed the need for leaders to continue to speak up and really make a case for these changes where they’re needed. Branzell: Absolutely, and I think our membership as a whole, especially our CIOs that are actively involved in the Washington public policy arena with us, knew this was something we needed to get out there. Again, it’s not that we’re against the system. We’re absolutely for Meaningful Use. We still think that’s the right direction. We still think the adoption of electronic health records and the outcomes that should come from that is absolutely the right direction, but occasionally you need to make small course corrections to stay on track. I think that’s really where we are, and I think for the industry as a whole, we’re pleased to see that our partnership with our Washington counterparts, both on the agency side and on the hill side, was very successful in the communication process. Gamble: Where do you think you stand now as far as the modifications? Is there anything else that needs to happen as far as making this official? Branzell: We’re still at the point in which things could go awry, but what we’re hoping to see is through what they call the MPRM notice for proposed rulemaking process they will come out with, the new rules that complement what they announced. And then that goes through a process and then they will enforced. But at this point, everyone in the industry is generally counting on the reporting period changes and are actually hopeful for other things we might see in that MPRM that would be possible outcomes for flexibility at this point. So there is some formality that still needs to occur; as part of anything that’s part of government rulemaking, we have to go through a formal rigid process. But that is all in the works, and so we should see something of the next few months that finalizes this. But as I said, the industry’s counting on it at this point. Gamble: It’s interesting, you pointed out that we’re in the midstream of Meaningful Use, and it is definitely a time where there is some reflection on it. It’s a question that I’d like to ask the CIOs we speak with — what are your thoughts on the progress at this point. As you can imagine, we get varied answers, but one of the most common threads is that it’s going in the right direction; it’s the right thing, but it’s just a matter of taking care of some of those details. Branzell: I think the other way you may want to look at this is it’s like any journey. If it’s 300 miles to go the beach and you leave, and you’re 150 miles into the journey and you have those kids in the car that keeps saying, ‘Are we there yet?’ — which we have plenty of people saying with Meaningful Use, ‘Are we there yet?’ — and you say, ‘No. We’re only halfway to the beach. You can’t put your bathing suit on yet.’ It’s time to actually realize we have another half of this journey to go. And I think that’s exactly where we are in Meaningful Use. Yes, we’ve seen positive outcomes. Yes, lives have been saved. Yes, many hospitals have changed their processes. We have a lot more work to do though. Gamble: That’s a really good analogy. I like that one. Now, you touched a little bit on the ONC Interoperability Standards Advisory, or roadmap, and I wanted to just get your thoughts on the impact that you hope that this will make in terms of moving toward more clear or definable standards? Branzell: So as we’ve been working with ONC in expressing the concerns that we’ve had, one of them — and this is actually something that many others have been calling to actually give the federal government — is the ability to create clear enforceable standards. The part that’s important there is ‘enforceable’ standards that apply across a broad spectrum of Meaningful Use, but in particular, EHR adoption. We don’t have that today, and it’s really a cornerstone problem in that if you don’t set the cornerstone right, everything else seems to be misaligned. Fortunately, in talking with the team at ONC, they are now working on these things and have actually agreed to put out what they call a standards guide, which though at this point is still not all the way there in being enforceable to the letter of the law, it at least gives us a clear picture of exactly what we need as an industry. Then I think there is some pushback to us and some responsibility on our part as associations and representatives of the industry to say, if standard X, version Y is exactly what we need to be doing, then we need to adopt that as associations, as an industry, as EMR vendors, whatever the case may be, instead of saying standard X, version Y, Z, 3, 7 and 9 — we can have any of those, and what really means is none of us have anything that’s clear standard. So I think there’s a dual responsibility here, both on the federal government side, as well as the industry side, to adopt and support these standards. Gamble: With ONC recently naming the first Chief Health Information Officer, do you think that at least the hope is that it can help further along this goal? Branzell: I do. And actually, there was a pretty strong concern on our part as there was a pretty serious exodus of some of the long-term leadership in there. In federal government, long term is 18 to 36 months, but in this case some people that had been in there for a while that we really respected had left. Now they have brought in quite a few individuals that we’ve had the opportunity to meet with. They seem extremely bright. They seem extremely hard-working, and so we are looking forward to all of their work, whether that’s Andy Gettinger or Mike McCoy. It doesn’t matter at this point as to the individuals, but rather, conceptually, do they have an entire leadership team dedicated to driving us forward? Individuals like Mike — yes, absolutely, we’re excited about having people like that in there that are representative of the industry and have actually lived in the trenches. We’re hopeful that will only reinforce standards and security and adoption of Meaningful Use and reasonableness and interoperability and all these cool buzzwords, which are what we need to get to the point where it’s truly functional for our nation. Gamble: I know that was back at the fall where we were seeing a lot of that turnover. You can’t blame people for having a little bit of concern about that. Branzell: I think it was more than ‘a little bit of concern,’ because it was people in very senior positions that were very, very trusted, and were very collaborative. When you see people that are very collaborative in working with the industry, in my case CHIME in particular, but many of the other associations or leaders across the industry, when there really are people that reach out and you see them disappear, a huge concern gets lit up. But at this point, what we’re seeing is they’re being replaced with people that have the same mindset, which is they don’t think they’re smarter than the industry that they’re serving. So I think in this case they’re very collaborative, and we’re hopeful that will continue.